Who, What, Why: Is it wrong to exercise in a graveyard? 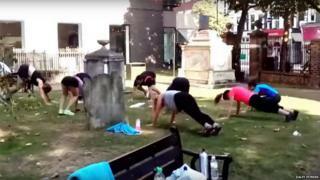 A fitness club owned by former British Olympic athlete Daley Thompson has been criticised for holding part of an exercise class in a graveyard. But was it disrespectful, and are there rules about what you can do in graveyards, asks Chris Stokel-Walker. The scene is an unusual one - a handful of people in luminous Lycra doing "burpees" among headstones and memorials at Putney Old Burial Ground in south-west London. And the moment, captured on a YouTube video advertising DaleyFitness, has raised eyebrows. One resident told the London Evening Standard that holding the class there was "disrespectful and thoughtless". No bodies have been buried at the site in more than 160 years, but those that were interred there still remain. The burial ground became a public garden in 1886, and eight park benches sit around the graves for passers-by to sit. A report by Wandsworth Council classes the site as "essentially a small 'sitting out' area, [which] provides a destination to walk to and an area for local workers to have lunch in". Gavin Sunshine, chief executive of DaleyFitness, says that other groups, including schoolchildren playing rounders, theatre productions and other personal trainers had used the burial ground. "If anyone feels we have disrespected the dead, we would like to apologise to the disrespected. We assumed - wrongly - that leisure activities go on in the park, so out of the blue we decided we'd finish one of our sessions, with 10 minutes remaining, in the sunshine." And this is the difficulty - graveyards straddle the line between public and private areas - places to mourn and remember the dead, but also thoroughfares, used as shortcuts or alternatives to parks. A spokeswoman for the National Association of Funeral Directors (NAFD) says that they would not like to see this kind of activity taking place in a still-active cemetery where bereaved families deserve privacy and silence in which to mourn. But the association's members "do support moves to encourage people to feel more at ease with the idea of death, and this can include encouraging the public to explore and enjoy historic cemeteries, particularly those that have been closed to new burials for many decades". For Giles Fraser, a former rector in Putney, and current parish priest at St Mary's, Newington, the distance in time from the last burial is an important factor in deciding what can and cannot be carried out in churchyards. "If there are likely to be no living, grieving relatives," he reasons, "one has a licence to treat it more as a park than a burial ground." Rudi Leavor, rabbi at Bradford's Reform Synagogue, and responsible for one of the city's two Jewish burial grounds, has a different opinion. "It's sacred ground," he says. "It's not a place to amble through to get from one place to another - it's not a place to exercise." In the Church of England, each individual church diocese sets the rules about what activities are permissible in graveyards, but there are general principles most follow. A Church of England spokesperson says: "Churchyards are consecrated by the bishop for the burial of the dead according to the rites of the Church of England and it is unlawful for churchyards to be put to any use that is inconsistent with this purpose." The spokesperson adds: "Churchyards aren't closed off spaces and people walk through regularly or stop to reflect; but it's about being respectful."